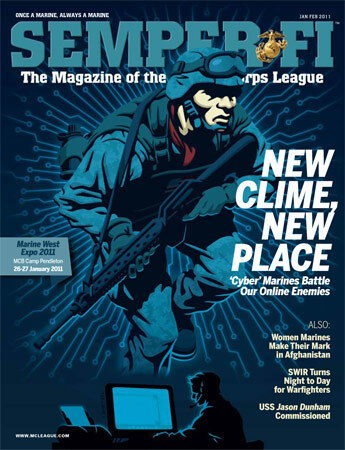 RICHARD SOLOMON ARTISTS REPRESENTATIVE: Chris Whetzel - Semper Fi, Oorah! 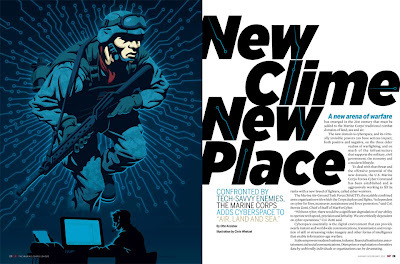 "Recently, I was commissioned by Semper Fi magazine to create an image for an article outlining a new approach in the fight against terror: the cyber soldier. Apparently, hacking is a major national security threat, and the military is training soldiers as well as incorporating tech-savvy civilians into a cyber-defense task force. "Here are the sketches. 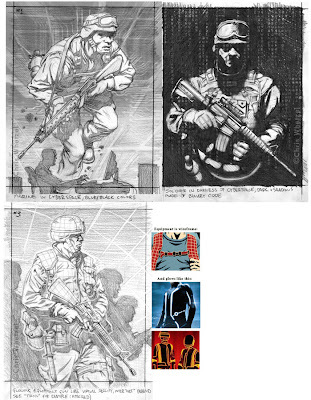 #1 is my take on a soldier at a CPU juxtaposed with his "cyber-self." #2 is a Matrix-type approach of a soldier being made of "code." #3 is a soldier in "cyber-gear" that is schematic/blueprint looking and glowing (Tron shown as example of glowing). "It was decided that #1 was the best visual, and I went to finish. I altered the figure at the desk as it was feeling a bit stiff. In dealing with color, I decided I like a cool feel to represent cyberspace; I also cooled down the camo of the uniform to reflect this. I would have loved to have worked more "tech"-style stuff into the image like the other two sketches, but it made sense to keep it a more realistic figure so that readers (soldiers and veterans) could easily relate and see themselves as this figure. "Bonus! After completing the art, the AD wanted to use the image for the cover as well!" Thanks, Jason! Your "Ooh La La" image is pretty awesome, too!